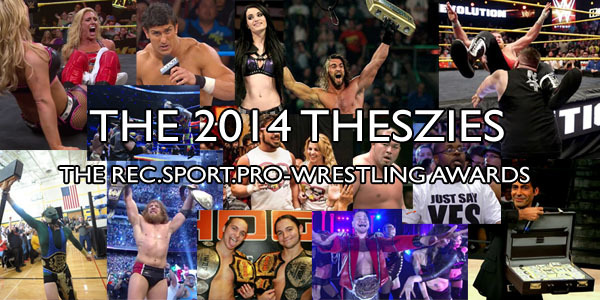 Voting is now open for the 2014 rec.sport.pro-wrestling Awards – the Theszies! You can vote HERE. We have added a new award this year for Best Wrestling Media, to celebrate independent wrestling journalism and commentary. This was done partially because we recognize the importance to the wrestling community of recaps, podcasts and fan reviews, and partially because fan-created media was threatening to completely overwhelm actual wrestling shows produced by wrestling companies in the Best TV/Youtube Show category, and while we’re fans of Botchamania and other shows like it, the work that goes into creating Botchamania is far different than the work that goes into creating a regular original wrestling program. We want fans of these fan-driven shows to be able to celebrate their favorite shows; we just don’t want actual wrestling to be ignored or overlooked in favour of it. Hence the new category. The deadline for entering votes is February 7, 2015. Have fun! Everyone should vote WWE vs WWE Fans for best feud. I’m sad that there aren’t summaries of the best/worst matches, though. Hell, there aren’t even event names. Maybe next year, we can get a Best Female Wrestler category? I mean, between WWE/NXT, TNA, SHIMMER, Japan, and some of Mexico, the quality of Joshi is as high as it’s been in a long, long time, and I think it would be nice to give them their due. I’m in agreement with Kyle. Fans online will talk up PWG all day long, but ignore Shimmer. Female wrestlers deserve more attention. CapnAndy: whoops, in the rush, I dropped the ball on descriptions. I might look into it. I wonder how many people that post here actually KNOW who Lou Thesz was and what he ACCOMPLISHED in the ring? They probably won’t but I hope Dragon Gate gets some votes in recognition for the absolutely killer year that they’ve had.